Rotation: The earth moves around its axis. This movement is called the rotation of the earth. Earth Day: The period of one rotation of the earth is called one earth-day. One earth-day is of 24 hours. Axis: The imaginary line around which the earth rotates is called its axis. Orbit: The imaginary line on which the earth moves around the sun is called its orbit. Orbital Plane: The plane passing through the earth (along its orbit) is called its orbital plane. 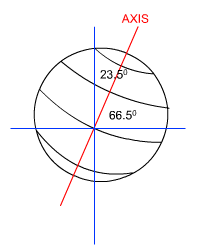 Tilt of Axis: Earth’s axis is tilted at an angle of 66.5o on its orbital plane. On the other hand; the earth’s axis is tilted at 23.5o on the line which is perpendicular to its orbital plane. Revolution: The movement of earth in its orbit around the sun is called revolution. Year: The time taken by the earth to complete one revolution is called one year. One year has 365 and ¼ days (365 days and 6 hours). For the sake of convenience, we consider a normal year to have 365 days. The extra six hours are added after every four years to add an additional day to the year. Thus, every fourth year is a leap year which has 366 days. While the rotation is responsible for day and night on earth, its revolution is responsible for changes in seasons. The revolution and tilt of the earth’s axis affect the changes in seasons. You have read in your earlier classes that the portion of the earth facing the sunlight experiences day. On the contrary, the portion which is away from the sun experiences night. What Would Happen if the Earth Did Not Rotate? If there had been no rotation of the earth; one half of the earth would have been constantly in daylight and another half would have been constantly in dark. The portion under sunlight would have been too hot. On the other hand, the portion in dark would have been freezing cold. Such extremes of temperature could have made it impossible for life to thrive on our planet. Circle of Illumination: The imaginary line which divides the parts of the earth with day and night is called the circle of illumination. 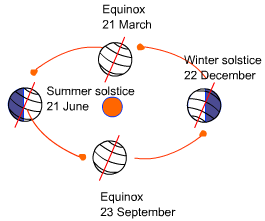 The circle of illumination is at right angle to the orbital plane. 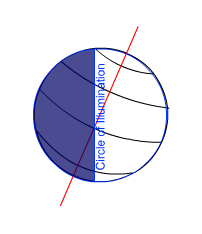 Thus, the circle of illumination is at an angle of 23.5o to the earth’s axis. Because of the angle between the circle of illumination and the axis; both the hemispheres of the earth do not get the same amount of light on most of the days. This causes different seasons at different times of the year. Look at the following figure to understand this. The orbit of the earth is elliptical in shape. Due to the elliptical shape of its orbit, the distance between the sun and the earth keeps on changing throughout the year. Sometimes, the earth is too close to the sun and at other times it is too far from the sun. Perihelion: The point at which a planet is nearest to the sun is called perihelion. Aphelion: The point at which a planet is farthest from the sun is called aphelion. When the length of day and night is equal in all parts of the earth, such a day is called equinox. This happens on 21st March and 23rd September. On 21st March, the South Pole of the earth is towards the sun. As a result; this is spring season in the northern hemisphere and autumn in the southern hemisphere. On 23rd September, the North Pole is towards the sun. As a result; this is spring season in the southern hemisphere and autumn in the northern hemisphere. The summer solstice falls on 21st June, while the winter solstice falls on 22nd December. On 21st June; the North Pole tilts towards the sun and the Tropic of Cancer receives direct sunlight. As a result, it is the longest day and shortest night in the northern hemisphere. On the contrary, it is the shortest day and longest night in the southern hemisphere. It is summer season in the northern hemisphere and winter in the southern hemisphere. Between 21st March to 23rd September, the North Pole receives sunlight continuously for about six months. So, it is six months’ day at the North Pole. On the other hand, the South Pole experiences six months’ night during this period. On 22nd December; the South Pole tilts towards the sun and the Tropic of Capricorn receives direct sunlight. As a result, it is the longest day and shortest night in the southern hemisphere. On the contrary, it is the shortest day and longest night in the northern hemisphere. It is summer season in the southern hemisphere and winter in the northern hemisphere. Between 23rd September to 21st March, the South Pole receives sunlight continuously for about six months. So, it is six months’ day at the South Pole. On the other hand, the North Pole experiences six months’ night during this period.